[This book] Explains complex yet critical legal and practical details on choosing, investigating and contracting to buy a business. The new edition includes updated tax laws and regulations. Steingold is the author of several highly respected business publications, several of them published under the Nolo umbrella. He is an expert on business law and advises entrepreneurs on how to start, buy, run and sell businesses. This book was a bit of a departure for me, because it’s firmly based in the bricks-and-mortar world (B&M) whereas my own interests lie in online business. That said, there are many similarities between B&M and online business, and even virtual businesses are subject to legal obligations and procedures. I felt it was necessary to explore small business acquisitions from both online and offline perspectives as part of the research for writing The Buyer’s Quest, my own guide to buying a website or online business. The book consists of five parts and 22 chapters. Additionally, the appendices contain a wealth of legal forms, checklists and other documents, which you can also download in editable format from Nolo. The book is based on the premise that you’ll save a lot of money if you learn to do things for yourself rather than hiring professionals. Sometimes it’s wise to have expert advice for some procedures, eg have a lawyer review the sales agreement before you sign it, but even then you’ll still save money if you understand what exactly needs to be done and why. This part explores reasons why you might want to acquire a business and different ways to achieve that goal. In the first two chapters, the author provides an overview of the route ahead through the book and then outlines the key steps. This includes a checklist of all that’s involved in the process, from coming up with a budget to closing your purchase. Additionally, he provides resources for the reader to do his/her own legal research (based on US law). Next, the author discusses the tax implications of buying a business. This is mostly relevant for a US-based readership and is accompanied by downloadable documents and other resources. He also covers some basic concepts which are applicable to all regardless of geographical location. Next he provides advice on how to find the right business for you, including suggestions of where to look. The advice is fine as far as it goes but, unfortunately, that’s not too far. It’s mostly about the “usual recipes” of looking in the press and via brokers. There aren’t any proactive or innovative ideas. Additionally, these (rather obvious) ideas are accompanied with a lot of rather obvious examples. This part of the book is a bit disappointing as it seems to nose-dive into a level most suited to a less well-informed and intelligent reader. The final chapter in Part 1 provides advice on dealing with professionals, such as lawyers, accountants, and brokers. Again much of this is squarely aimed at the US-based reader, and whilst some of the basic concepts may be useful to readers elsewhere, for me as a UK-based reader I felt that this was a fairly serious limitation of the book. As is the case with every chapter, it ends with a checklist to sum up the salient points. This part kicks off with a chapter about financing your purchase, whether lump sum or down payment and instalments. There is also advice about reducing risk and what to look out for, as well as how to raise funds for the purchase and various methods of securing any loans. He also explains and describes the use of an escrow agent. He next goes on to describe some ways to finance your purchase. Whilst much of this is fairly basic to those with even a little business experience, these and the cautionary notes seem worth including, for those who are new to the game and for the sake of completeness. Next up is some discussion of the structure of your planned purchase and whether you’re buying equity or assets. All good stuff. This also covers the seller’s future role (if any) and that of the employees of the business. By this time, we’re at Chapter 9 and this is the “investigation stage”. Once again, this is a basic outline and squarely aimed at those interested in B&M business. If your interest is in acquiring an online business, you will definitely need to read further. Then follows some legal procedures for the purchase along with several (basic) examples, and some sample documents. This part covers preparing the sales agreement and other legal documents. Given that it was written by a well respected lawyer and writer of business books, this part pretty much does what it says on the tin. And because the sales agreement is the master document which “dwarfs all others”, the following seven chapters are devoted to it. This is quite heavy going but worth it, especially if you’re considering parting with a lot of money for a business. The good news is that the author also provides a simple overview in tabular form which is very helpful. If you’re reading the book with a view to buying a business rather than just for interest, then you should pay great heed to this part of the book. This part covers preparing the promissory note and other sales documents, including the Bill of Sale. Basically this is a continuation of the earlier chapters which cover the sales agreement. It takes you through all the steps of how to prepare various other legal documents necessary for the sale. The information appears to be very thorough, but the author’s legal background shows strongly here in that there’s so much of the book devoted to the preparation of legal documents while other subjects such as business valuation and due diligence are somewhat skimmed over. Depending on your own individual needs, this could be essential reading for you. As usual, the information is accompanied by lots of sample documents, notes of caution, and even tips when you can skip ahead if something isn’t directly relevant to your purposes. And at last – closing the deal. Much of this relates to B&M purchases and larger online business sales and covers the finalisation of the deal after all the preparatory papers and agreements have been dealt with. It’s helpful to have a closing checklist, and the author provides a master checklist for you to adapt for your own purposes. The book then finishes up with tidying up last-minute problems which may arise, a brief discussion of tax implications (for US-based businesses), and a quick look ahead to the future and running a business. The appendices contain numerous documents for your personal use. Finally there is an alphabetical index of the book’s contents, but given that it has neither page numbers nor hyperlinks, I’m not sure how much benefit this is to the reader. 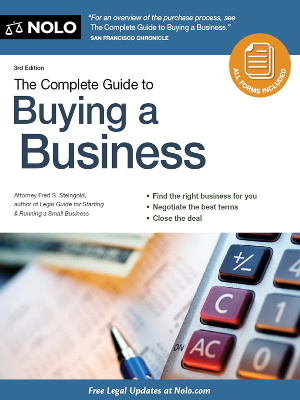 This is an excellent book encompassing the entire process of buying a small business. It was easy to read and understand, and extremely well presented. However, despite its title, it’s more of a starting point than a complete guide. If you’re thinking of buying a business, even an online one, then this is a must-read for all the basic methods and principles. For a website or online business purchase, you may need to find additional advice elsewhere, eg valuation and due diligence differ for an online business. This is the most comprehensive guide I’ve found yet for buying a small B&M business. Highly recommended if you’re contemplating buying a business, but my recommendation comes with the caveat that it’s an excellent starting point and you will need to read further to build a “complete” guide to the process.